Hero Fiennes Tiffin played young Tom Riddle at the age of 11 in Harry Potter and the Half-Blood Prince (2009). 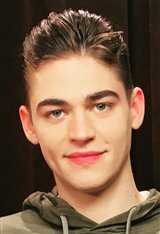 He got the role because his mother, director Martha Fiennes, knew the casting directors for the film and she suggested Hero to them, although she had to persuade the boy to do it. His father, George Tiffin, is also a director. Hero made his feature film debut the year earlier, playing a young pickpocket in the critically acclaimed British independent film Bigga Than Ben (2008) starring Ben Barnes. Three years later he went on to play Young Charlie, the young version of Jack O'Connell's character in the British film Private Peaceful (2012). Hero, whose uncles are Ralph Fiennes and Joseph Fiennes, then took a break from acting and returned to it at 20, with a regular role as Ioan Fuller on the Netflix series Safe in 2018, and the following year, a recurring role as Jake in the ITV series Cleaning Up. He landed his first starring role in the big screen romantic drama After (2019), based on the bestselling Harry Styles fan fiction book series by Anna Scott. Hero, who has also worked as a model for clothing companies such as H&M and Dolce & Gabbana, has an older brother, Titan Fiennes Tiffin, and a younger sister, Mercy Fiennes Tiffin. Apart from acting, Hero loves sports, soccer in particular. He used to play for the Lambeth All Stars, an under-12 team in London.